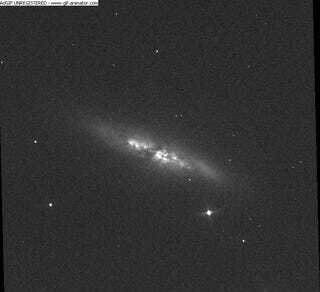 A white dwarf exploded last night up in the Cigar Galaxy (also known as M82 to its friends), creating the closest supernova we've seen in the last 25 years — and one of the brightest, too. Top image: Emerging supernova in M82 / via Ernesto Guido, Nick Howes, Martino Nicolini of Remanzacco Observator. Image: Before and after shots of the M82 galaxy, catching the appearance of the supernova — UCL/University of London Observatory/Steve Fossey/Ben Cooke/Guy Pollack/Matthew Wilde/Thomas Wright. Of course, the closeness of the supernova is relative — neighboring galaxy M82 is still about 12-million light years away from us. But at that distance and brightness, the over-skies drama unfolding is easily within range of scientific observatories, and might even be able to be caught on a backyard telescope. The as yet unnamed supernova, which scientists are temporarily referring to by the not terribly catchy PSN_J09554214+6940260, has been classified as a Type Ia supernova, a supernova formed by either the collision or, in this case, explosion of a star. They're also commonly used by astronomers to measure distances across the universe. 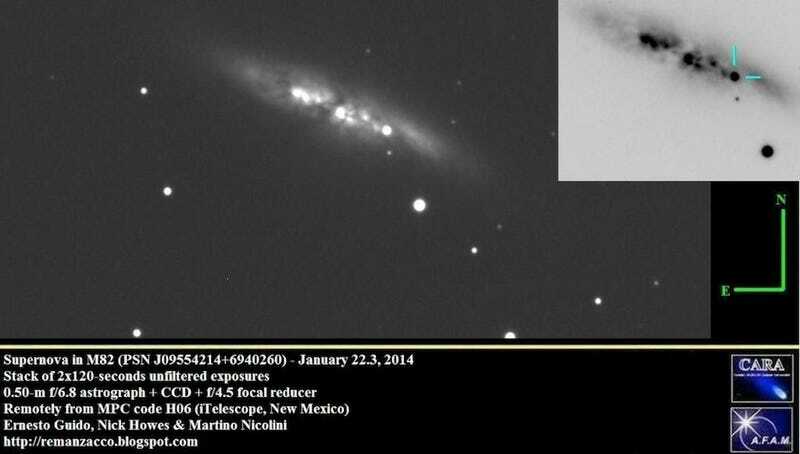 Animation: Supernova appearing in M82 / via Ernesto Guido, Nick Howes, Martino Nicolini of Remanzacco Observatory.